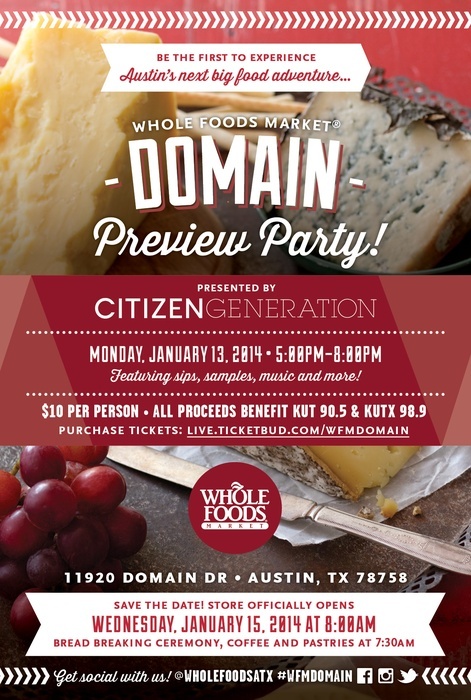 I will be performing my AUSTIN CENTRIC set Monday Jan 13th at the Grand Opening Preview Party for the new Whole Foods in the Domain. The address is 11920 Domain Dr. Austin, 78758. I will be out on the patio from 5-8pm. Tickets are $10 and all proceeds go to benefit KUT 90.5 and KUTX 98.9 Austin. Get tickets here and come see me. This entry was posted in Shows and tagged ATX, Austin, citizen generation, DJ, domain, grand opening, Mixer, Mixer Rogers, Party, preview, Rogers, Whole Foods. Bookmark the permalink.